فرازش یا تصعید به گذرشِ حالتِ ماده‌ای از جامد به گاز گفته می‌شود. در این گذرش حالت، ماده به حالت میانی آبگون یا مایع نمی‌گذرد. از نمونه‌های آشنا برای فرازش می‌توان گذرش نفتالین به گاز و گذرش برف به بخار را نام برد. فرازش وارون چگالش است که در آن ماده از گاز به جامد می‌گذرد. بسیاری از بُن‌پارها و چندساخت‌های شیمیایی در فشار معمولی (هنجارمند) و در دماهای گوناگون در یکی از سه حالت جامد، آبگون یا گاز یافت می‌شوند؛ هم‌چنین گذرش از جامدی به گازی بیش‌تر همراه با گذرش به حالت میانی آبگونگی است (فشار در این‌جا فشار پاری ماده است و نه فشار سامانه (برای نمونه فشار هواسپهری)). از همین روی، بیش‌تر جامدهایی که دارای فشاری بالا باشند در دمایی ویژه می‌توانند از جامد به گاز بگذرند. برخی بن‌پارها مانند کربن و آرسنیک دارای فشار نقطهٔ سه‌تایی بسیار بالایی هستند و آبگون‌هان آن‌ها کم‌تر یافت می‌شوند. از این روی، فرازش برای این بن‌پارها بیش‌تر از بخارش روی می‌دهد. فرازش به گذرش حالت گفته می‌شود و نه به ترادیسی از جامدی به گازی در واکنشی شیمیایی. برای نمونه، سوختن شمع مومی (موم پارافینی) به کربن دی‌اکسید و بخار آب فرازش نیست بلکه واکنشی شیمیایی با اکسیژن است. فرازش دگرشدی گرماگیر است و نیاز به کاروژ (انرژی) بیش‌تری دارد. می‌توان درون‌گرمیِ فرازش (که گرمای فرازش نیز خوانده می‌شود) با جمع درون‌گرمی رشانِش و درون‌گرمی بخارش به دست آورد. درون‌گرمی مولی فرازش، مقدار گرمایی است که بایستی به یک مول از جامد داده شود تا یک‌راست به گاز بگذرد. مولکول‌ها در یک بلور، پیرامون محور خود در شبکه می‌جنبند. پخش انرژی جنبشی میان این مولکول‌ها مانند پخش انرژی جنبشی میان مولکول‌های آبگون و گاز است. در یک بلور، انرژی از مولکولی به مولکول دیگر رفته و از این‌رو انرژی هیچ مولکولی پایدار نیست. مولکول‌های پرانرژی در رویهٔ بلور می‌توانند بر نیروهای جاذبه بلور چیره شده، به حالت بخار بگریزند. اگر بلور در یک ظرف سربسته باشد، سرانجام حالت تعادلی برقرار می‌شود که در آن حالت، سرعت جدا شدن مولکول‌ها از جامد با سرعت بازگشت مولکولهای بخار به بلور برابری می‌کند. فشار بخار یک جامد در دمای معین، معیاری از تعداد مولکول‌ها در حجم معینی از بخار در حالت تعادل است. گرچه فشار بخار برخی از جامدات، بسیار کم است، ولی هر جامدی دارای فشار بخار است. مقدار فشار بخار با قدرت نیروهای جاذبه نسبت عکس دارد. به همین علت، فشار بخار بلورهای یونی بسیار کم است. توانایی مولکول‌ها برای غلبه بر نیروهای جاذبه بین مولکول‌ها با انرژی جنبشی آن‌ها بستگی دارد. از این‌رو، فشار بخار جامدات با افزایش دما زیاد می‌شود. منحنی تغییرات فشار بخار برحسب دما نشان می‌دهد که این منحنی در نقطه انجماد، منحنی فشار بخار آب را قطع می‌کند. در نقطه انجماد، فشار بخار جامد برابر با فشار بخار مایع است. نقطه انجماد نرمال آب (در فشار کل یک اتمسفر) در غیاب هوا ۲۵x۱۰–۴ درجه سانتیگراد است؛ ولی در هوا و در فشار کل یک اتمسفر نقطه انجماد آب ۰٫۰۰۰۰ درجه سانتیگراد می‌باشد و این مقداری است که معمولاً گزارش می‌شود. این اختلاف در نقطه انجماد، از هوای محلول در آب ناشی می‌شود. نمودار فاز دی‌اکسید کربن، گونه‌ای از نمودار فاز موادی است که در فشار معمولی به جای ذوب شدن و جوشیدن می‌فرازد. در فشار ۵٫۱۱ اتمسفر نقطه سه‌گانه سامانه دی‌اکسید کربن، ۵۵٫۶ - درجه سانتیگراد است. دی‌اکسید کربن مایع، تنها در فشارهای بالاتر از ۵٫۱۱ اتمسفر وجود دارد. اگر دی‌اکسیدکربن جامد (یخ خشک) تحت فشار یک اتمسفر گرم شود، در دمای ۷۸٫۵ - درجه سانتی‌گراد مستقیماً به گاز تبدیل می‌شود. ↑ Sublime. Dictionary.reference.com. Retrieved on 2015-11-25. مشارکت‌کنندگان ویکی‌پدیا. «Sublimation (phase transition)». در دانشنامهٔ ویکی‌پدیای انگلیسی، بازبینی‌شده در ۱۱ نوامبر ۲۰۱۷. در ویکی‌انبار پرونده‌هایی دربارهٔ تصعید موجود است. 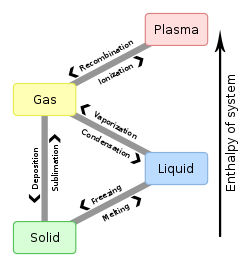 Sublimation is the transition of a substance directly from the solid to the gas phase, without passing through the intermediate liquid phase. Sublimation is an endothermic process that occurs at temperatures and pressures below a substance's triple point in its phase diagram, which corresponds to the lowest pressure at which the substance can exist as a liquid. The reverse process of sublimation is deposition or desublimation, in which a substance passes directly from a gas to a solid phase. Sublimation has also been used as a generic term to describe a solid-to-gas transition (sublimation) followed by a gas-to-solid transition (deposition). While a transition from liquid to gas is described as evaporation if it occurs below the boiling point of the liquid, and as boiling if it occurs at the boiling point, there is no such distinction within the solid-to-gas transition, which is always described as sublimation. At normal pressures, most chemical compounds and elements possess three different states at different temperatures. In these cases, the transition from the solid to the gaseous state requires an intermediate liquid state. The pressure referred to is the partial pressure of the substance, not the total (e.g. atmospheric) pressure of the entire system. So, all solids that possess an appreciable vapour pressure at a certain temperature usually can sublimate in air (e.g. water ice just below 0 °C). For some substances, such as carbon and arsenic, sublimation is much easier than evaporation from the melt, because the pressure of their triple point is very high, and it is difficult to obtain them as liquids. The term sublimation refers to a physical change of state and is not used to describe the transformation of a solid to a gas in a chemical reaction. For example, the dissociation on heating of solid ammonium chloride into hydrogen chloride and ammonia is not sublimation but a chemical reaction. Similarly the combustion of candles, containing paraffin wax, to carbon dioxide and water vapor is not sublimation but a chemical reaction with oxygen. Sublimation is caused by the absorption of heat which provides enough energy for some molecules to overcome the attractive forces of their neighbors and escape into the vapor phase. Since the process requires additional energy, it is an endothermic change. The enthalpy of sublimation (also called heat of sublimation) can be calculated by adding the enthalpy of fusion and the enthalpy of vaporization. Solid carbon dioxide (dry ice) sublimes everywhere along the line below the triple point (e.g., at the temperature of −78.5 °C (194.65 K, −109.30 °F) at atmospheric pressure, whereas its melting into liquid CO2 can occur only along the line at pressures and temperatures above the triple point (i.e., 5.2 atm, −56.4 °C). Snow and ice sublime, although more slowly, at temperatures below the freezing/melting point temperature line at 0 °C for most pressures; see line below triple point. In freeze-drying, the material to be dehydrated is frozen and its water is allowed to sublime under reduced pressure or vacuum. The loss of snow from a snowfield during a cold spell is often caused by sunshine acting directly on the upper layers of the snow. Ablation is a process that includes sublimation and erosive wear of glacier ice. Naphthalene, an organic compound commonly found in pesticides such as mothballs, sublimes easily because it is made of non-polar molecules that are held together only by van der Waals intermolecular forces. Naphthalene is a solid that sublimes at standard atmospheric temperature with the sublimation point at around 80 °C or 176 °F. At low temperature, its vapour pressure is high enough, 1 mmHg at 53 °C, to make the solid form of naphthalene evaporate into gas. 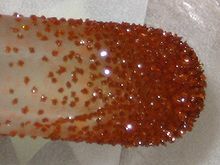 On cool surfaces, the naphthalene vapours will solidify to form needle-like crystals. Iodine produces fumes on gentle heating. It is possible to obtain liquid iodine at atmospheric pressure by controlling the temperature at just above the melting point of iodine. In forensic science, iodine vapor can reveal latent fingerprints on paper. Arsenic can also sublime at high temperatures. Cadmium and zinc are not suitable materials for use in vacuum because they sublimate much more than other common materials. 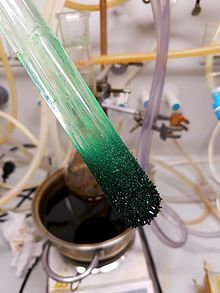 Sublimation is a technique used by chemists to purify compounds. A solid is typically placed in a sublimation apparatus and heated under vacuum. Under this reduced pressure, the solid volatilizes and condenses as a purified compound on a cooled surface (cold finger), leaving a non-volatile residue of impurities behind. Once heating ceases and the vacuum is removed, the purified compound may be collected from the cooling surface. For even higher purification efficiencies, a temperature gradient is applied, which also allows for the separation of different fractions. Typical setups use an evacuated glass tube that is heated gradually in a controlled manner. The material flow is from the hot end, where the initial material is placed, to the cold end that is connected to a pump stand. By controlling temperatures along the length of the tube, the operator can control the zones of re-condensation, with very volatile compounds being pumped out of the system completely (or caught by a separate cold trap), moderately volatile compounds re-condensing along the tube according to their different volatilities, and non-volatile compounds remaining in the hot end. Vacuum sublimation of this type is also the method of choice for purification of organic compounds for use in the organic electronics industry, where very high purities (often > 99.99%) are needed to satisfy the standards for consumer electronics and other applications. ^ Boreyko, Jonathan B.; Hansen, Ryan R.; Murphy, Kevin R.; Nath, Saurabh; Retterer, Scott T.; Collier, C. Patrick (2016). "Controlling condensation and frost growth with chemical micropatterns". Scientific Reports. 6: 19131. Bibcode:2016NatSR...619131B. doi:10.1038/srep19131. PMC 4726256. PMID 26796663. ^ "Sublime". Dictionary.com Unabridged. Random House. ^ Fassnacht, S. R. (2004). "Estimating Alter-shielded gauge snowfall undercatch, snowpack sublimation, and blowing snow transport at six sites in the coterminous USA". Hydrol. Process. 18 (18): 3481–3492. Bibcode:2004HyPr...18.3481F. doi:10.1002/hyp.5806. ^ Caroll, J. (2014). 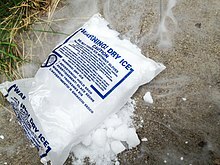 Natural Gas Hydrates. p. 16. ISBN 9780128005750. ^ Staff writer(s) (2015). "what solid go through sublimation?". National Science Foundation and UCSB School-University partnership. Retrieved 13 November 2015. ^ Pavia, D. (2005). Introduction to organic laboratory technique. pp. 781–782. ISBN 978-0534408336. ^ Girard, James (2011). Criminalistics: Forensic Science, Crime and Terrorism. Jones & Bartlett Learning. pp. 143–144. ISBN 978-0-7637-7731-9. ^ Harwood, Laurence M.; Moody, Christopher J. (1989). Experimental organic chemistry: Principles and Practice (Illustrated ed.). WileyBlackwell. pp. 154–155. ISBN 978-0-632-02017-1. ^ Barrett, Francis (1815). The lives of alchemystical philosophers: with a critical catalogue of books in occult chemistry, and a selection of the most celebrated treatises on the theory and practice of the hermetic art. Macdonald and Son for Lackington, Allen, & Co. p. 233. ^ DiBernard, Barbara (1980). Alchemy and Finnegans wake. SUNY Press. p. 57. ISBN 978-0873953887. ^ Ripley, George (1591). Compound of Alchemy. ^ Gavezzotti, A. (1997). Theoretical Aspects and Computer Modeling of the Molecular Solid State. Chichester: Wiley and Sons. ^ McDonagh, J. L.; Nath; De Ferrari, Luna; Van Mourik, Tanja; Mitchell, John B. O. (2014). "Uniting Cheminformatics and Chemical Theory To Predict the Intrinsic Aqueous Solubility of Crystalline Druglike Molecules". Journal of Chemical Information and Modeling. 54 (3): 844–56. doi:10.1021/ci4005805. PMC 3965570. PMID 24564264. ^ McDonagh, James; Palmer, David S.; Van Mourik, Tanja; Mitchell, John B. O. (17 October 2016). "Are The Sublimation Thermodynamics of organic molecules predictable?". Journal of Chemical Information and Modeling. 56 (11): 2162–2179. doi:10.1021/acs.jcim.6b00033. hdl:10023/11874. ISSN 1549-9596. PMID 27749062. این صفحه آخرین‌بار در ‏۲۷ دسامبر ۲۰۱۸ ساعت ‏۱۵:۲۹ ویرایش شده‌است.